Home / News, Other Political News / Former MCA hospitalized after he was given a dog’s beating by Governor KIBWANA’s bodyguard-Did the Governor order his beating? Former MCA hospitalized after he was given a dog’s beating by Governor KIBWANA’s bodyguard-Did the Governor order his beating? 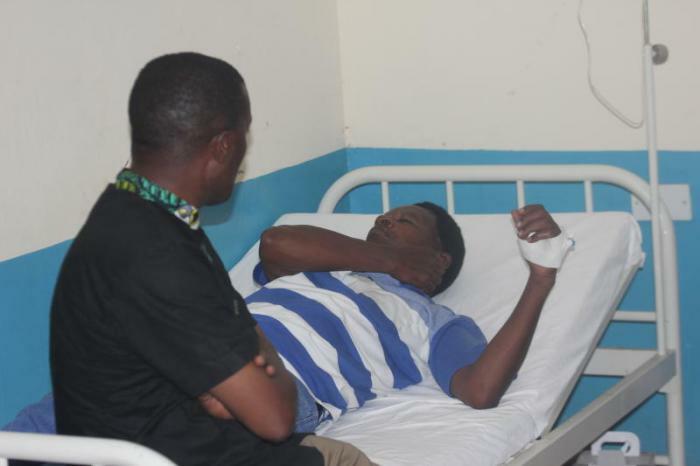 Monday February 4, 2019-Former Member of County Assembly for Wote Ward in Makueni County is nursing serious injuries after he was clobbered by Makueni Governor Kivutha Kibwana’s bodyguard. Sammy Maseka has been hospitalized following an assault incident that happened on Saturday in Itandi, Makueni County, where he was attending a burial ceremony. According to Maseka, Governor Kivutha Kibwana’s security detail by the name Muinde Musyoka punched him several times before he collapsed. “He jumped on my neck, twisted it and rained blows on me before throwing me to the ground,” he recounted. The assault happened after Maseka called out the Makueni Governor for disrespecting Wiper Leader, Kalonzo Musyoka, and told him that he could never be equal to the Ukambani kingpin. Even though the Governor Kibwana was not present at the scene, Maseka expressed his suspicion that the bodyguard had been sent to threaten and silence him. “When I was attacked the Governor wasn’t present. I think the guard had been sent to specifically attack and silence me,” Maseka stated.